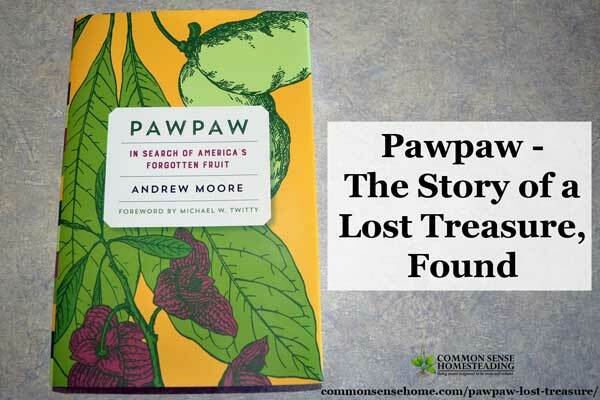 “Pawpaw – In Search of America's Forgotten Fruit” tells a story of a uniquely American treasure that was lost but is being found again. Like many, I had never heard of the pawpaw, North America's largest native fruit. I discovered it while learning about permaculture plantings, and I wanted to know more. “Pawpaw” takes you on a virtual tour of pawpaw territory, comparing the history of the pawpaw in a region with the state of the pawpaw in that area today. It's an eye-opening journey that speaks not just to the fate of the pawpaw, but to the fate of local food systems as a whole. It also offers hope for the revival of local food systems under the watchful eyes of a growing number of passionate foodies who want to recapture the way food used to taste. 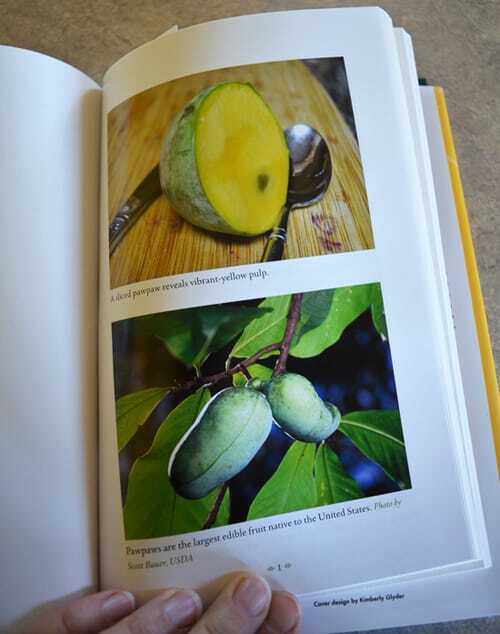 Pawpaws in History introduces the reader to the pawpaw fruit, its growth habit, range, and historical mentions. There are discussions at various attempts at improving the wild fruit – some of which failed, some of which succeeded and led to the cultivars available today. From providing sustenance to hungry travelers and country folk in times good and bad, to developing into a premium crop for high end markets, there's a lot to learn about the pawpaw. Pawpaws to the People shares the stories of people who've had a hand in pawpaw breeding and working to introduce the pawpaw to a larger audience. There is heartbreak and triumph. The festive atmosphere of the world's biggest pawpaw festival and luscious pawpaw ice cream walks side by side with the story of growers who lost everything due to drought and flooding (pawpaws don't like either extreme). There are always risks in farming, and developing a new commercial crop are some of the greatest. Travels in the Pawpaw Belt takes the reader down scenic rivers and hiking though forest trails, to visiting sleepy little townships and historical venues – including Monticello, where Thomas Jefferson is believed to have cultivated pawpaws. You can almost smell the rich forest loam and and fresh fallen rain trickling through the wooded valleys. As a beginning permaculture food forest grower who someday hopes to be able to derive supplementary income, I was particularly interested in the different strategies adopted by the commercial growers. Pawpaws seems to have excellent potential for growing organically, because it is bothered by very few pests in comparison to most fruit trees. It can also be grown in partial shade as an understory tree in a permaculture food forest – although best fruit production occurs in full sun. The hitch in massive scale pawpaw production is its perishability. Once ripe, pawpaws will hold for less than a week, even with refrigeration. They also bruise easily, which is a problem in a market that demands cosmetically perfect fruit. These are something the home gardener can work with, but are barriers to market entry. Jim and Donna Davis of Deep Run Orchard in Maryland deal with the problem by pruning their trees to keep the fruit reachable from ground level, and hand picking each fruit at the perfect point of ripeness to ship to specialty markets. Mark Boone of Michigan tackles the problem from a different angle. He heavily mulches under his trees with three to five feet of straw, and picks the dropped fruit out of the its comfy straw bed. Since Mark's fruit is processed into pulp for ice cream, minor scratches or blemishes are not an issue. The pawpaws natural pest control compounds protect it from voles that would normally be a problem with large amounts of straw in an orchard. I don't think we'll ever see pawpaws year round in every grocery store like apples, but I believe they will make headway as a seasonal specialty item, or become a versatile ingredient in other products like the pomegranate. There are also some promising studies going on for the use of pawpaw in cancer treatment. It's a very cool thing to learn about the revival of a forgotten fruit whose time may have come to shine again. If you're interested in local foods and pest free fruit trees, take the time the check out the pawpaw. You'll be glad you did. Note: I did receive a copy of this book for review. As always, my opinions are my own. we call Pawpaw “the Indiana Banana” . The trees grow wild down here. I use the pulp, for ice cream and make a pawpaw jam. It’s good. 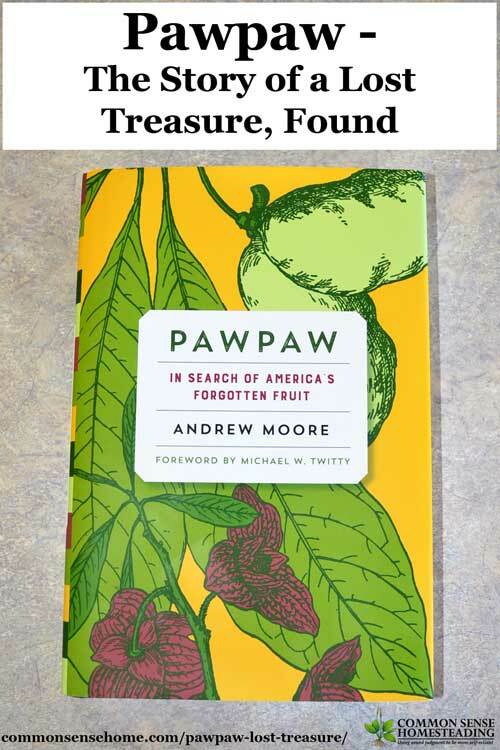 There’s a whole chapter of the book devoted to the pawpaws of Indiana. I’m jealous! We were pleasantly surprised to find a grouping of Paw-Paw trees on our property. They are on a shaded hillside, so not overly producing. Having only eaten them raw so far I like the sound of paw-paw ice cream. What is the growing range? Can I grow one in Zone 5? I hope so, as I’m in zone 5. They grow wild up into the lower edge of Michigan. The slope you have placed your fruit orchard on looks gently sloped, and I am guessing it;s to capture southern sun, and appears heavily planted. What else are you doing to create a zone 5 micro-climate? The photo of the sliced paw-paw looks a bit like sapote, I love fruits like that, not sugary sweet, but richly flavored and scented. Our fruit orchard is also on a slope. It gets eastern and western sun most of the year and southern sun in spring and for whatever part of the summer the sun gets above the mixed hardwoods on that side. Our fruit trees are mostly planted in front of a line of old hawthorns that fringe a grove of hardwoods to the north and the roadway below the hill. I figured if the hawthorns survived 20 years of absolute neglect including an 8 year drought on sandy sand loam, there’s something really good about that area. We are applying a generous mulch of compost and amending with basalt with what looks like bio-char as well azomite to liven up the soil. So far I haven’t suggested a tent or building compost piles behind our little fruit babies, but the thought has crossed my mind! We’re in zone 5 (about 15 miles from Lake Michigan), but we get strong winds here. The first thing we did when we moved here was to plant a treeline to the north and west to block the prevailing winds. We actually have two primary orchard areas, plus the swales and other fruit and nut areas. The pawpaws are in the orchard area next to the nuttery, which you can see on the site overview in this post – https://commonsensehome.com/homestead-permaculture-project/ They’re protected somewhat by the treeline and the hill, and we hope to someday have a pond to the east to offer an additional temperature buffer.